The face of the medal of the Norwegian Nobel Committee shows Alfred Nobel in a pose slightly different from that of the other medals. The inscription is the same. 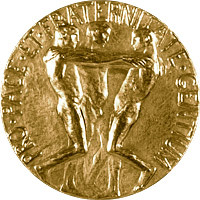 The other side of the Nobel Peace Prize medal represents a group of three men forming a fraternal bond. translated “For the peace and brotherhood of men”. “Prix Nobel de la Paix”, the relevant year, and the name of the Nobel Peace Prize Laureate is engraved on the edge of the medal. 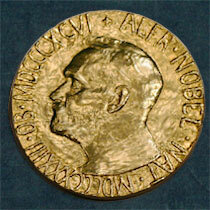 The Nobel Peace Prize Medal was designed by Gustav Vigeland. Since 2012 the Nobel Medals has been manufactured by Det Norske Myntverket (Mint of Norway) in Kongsberg.